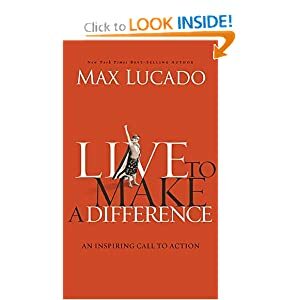 Live to Make a Difference is a companion book to Outlive Your Life: You Were Made to Make a Difference also from Max Lucado. With only 45 pages of text it is a very quick read! I read through several chapters repeatedly, but still took less than a half hour to digest. I enjoyed the simple focus of the book. Max did a great job of communicating his core message, without feeling like I'd been swindled by the brevity and have to purchase his other book for the full effect. I'm sure there is more to glean in Outlive Your Life, but I found plenty here too. Overall Lucado is impressing Christians like myself, specifically in America, to take action. He doesn't direct the action, just attempts to get us moving. His gentle reminders of Jesus' commands prod me toward helping others in need. Luke 4:18-19 “God's Spirit is on me; he's chosen me to preach the Message of good news to the poor, Sent me to announce pardon to prisoners and recovery of sight to the blind, To set the burdened and battered free, to announce, "This is God's year to act!" To announce that it's time to act! Jesus had a plan. He wasn't passive in his approach. He didn't wilt at the first opportunity to stand up and speak. He made plain that there was something happening, that it was good, and that it was happening now. Act good for the sake of others, not to be seen by them. Historically hypocrites were known by another term, "actors!" Take that to heart! Act knowing that when we do good to those in need, we are doing that good to Jesus. As I read Live to Make a Difference I realized that I am called to follow Jesus, to change my life and live in alignment with Jesus' instruction. It is not up to me to change others, only to show them love in my actions and approach. Pick up a copy or two of Live to Make a Difference. Share 'em with a friend. Let me know what you think. How can you put these principles into practice? Have you read Outlive Your Life or Live to Make a Difference?